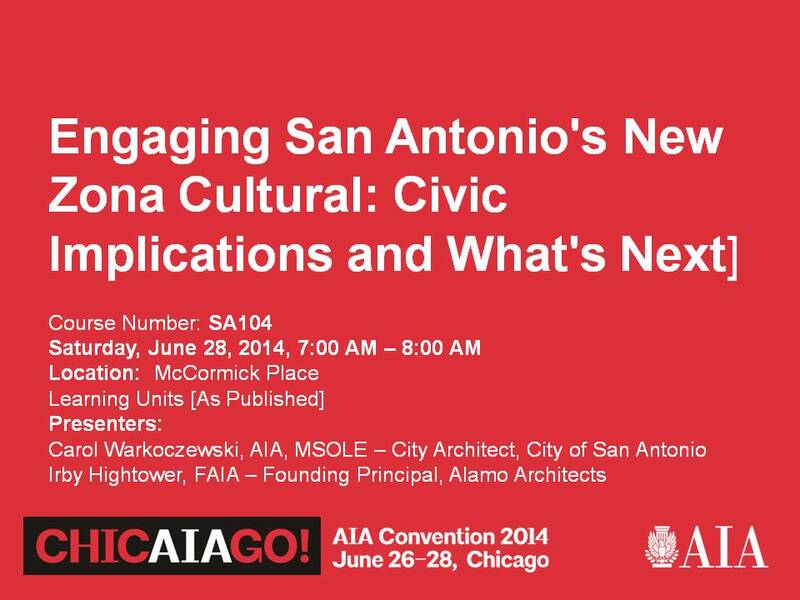 Austin, Texas (July 22, 2014) “Engaging San Antonio’s New Zona Cultural: Civic Implications and What’s Next” was well received at the American Institute of Architects (AIA) national convention on June 28, 2014, in Chicago. Co-presented by Carol Warkoczewski, AIA, City Architect, San Antonio, and Founder of the Institute for Leadership in Capital Projects (I-LinCP), and Irby Hightower, FAIA, Founding Principal, Alamo Architects, the one-hour presentation explored the why’s and how’s of the creation of the new cultural zone in a major city and its potential impact on economic development and community revitalization. An important part of the presentation was a discussion of the public engagement process needed to bring the newly-recognized, El Mercado Zona Cultural, to the San Antonio City Council in January 2014. The presentation included why this cultural zone is important to further the “Decade of Downtown” and to realize Mayor Julian Castro’s vision of vibrant and authentic experiences for San Antonio residents and visitors alike. The new El Mercado Zona Cultural leverages several downtown nodes into a cohesive, interpretive area. The recent designation of the Zona Cultural by the City of San Antonio provides opportunities to further the cohesive development of San Antonio while underscoring the area's rich cultural and architectural history. The presentation included the importance of this area to the history of San Antonio, and how what was important in the past can be appreciated and leveraged to support this fast-growing and vibrant city, resulting in a place that is the same, but richer, more vibrant, and much more appreciated. The presentation included an opportunity for the audience members to consider their own cities and to identify their own city’s unique “story” that could be told through the development of a cultural zone. The presentation concluded with identifying the role that architects play in the process, and how to engage a community of diverse stakeholders toward a common vision. In the AIA’s post-convention survey, 100% of survey respondents responded that they would recommend the session to their colleagues; 100% said the presentation included real-life, practical examples and/or anecdotes; and, 100% thought the presentation flow was clear, sequential and deliberate. 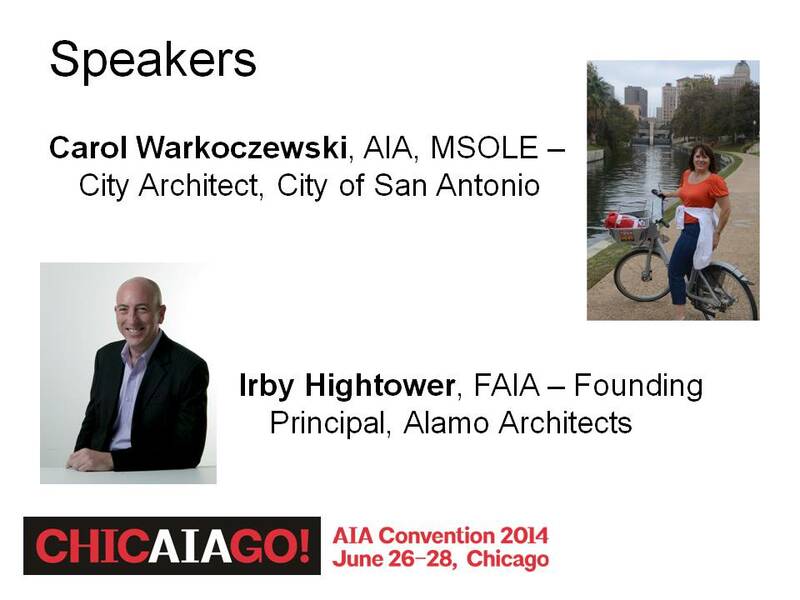 This is the third year in a row that Ms. Warkoczewski has presented at the national AIA convention.